This chap didn't suffer the same fate as Adolph Messimy, though you may think he should have done . .
For anybody new - this is a second incarnation of the thread with 80,000 views, 8000+ posts and 330 pages. For some unexplained reason and without any warning or notice it was translated to Skindles, where images cannot be posted. Is this chap French as well? Yes. French, but Viviani . . . non. Right lines though . . . .
Only four posts so far? Well done David on having the last word on the old thread. In regard to jam or cream on a scone first there is a TEL connection there as this is what he served to Thomas and Florence Hardy at Clouds Hill. Could not resist the first mention of TEL and sincerely hope this is not "off topic". For Stoppage Drill. Was it TEL and Gilbert Clayton? I think so. Finally found you all again, after the dumbfounding move to here. Couldn`t understand where the thread had disappeared to yesterday when I tried to clock in. I expect I wasn`t the only one that would have appreciated a notice of some sort from the mod`s. Let`s hope that they will afford us the courtesy of still allowing access to the old thread. Otherwise, are we going to be working from memory when trying to avoid duplications? My memory isn`t what it used to be, that`s for sure, but Memory Man himself is gonna start to struggle with 8000 posts. Just checked, and we can still use the search facility in the old thread. Looks like #1 here will be the alpha and omega, so I'll kill him off and we can go back to where we came from. 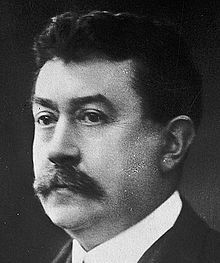 Paul Painlevé, French PM a couple of times, supported Nivelle (steady, Ridgus) before the 1917 offensive. Sacked him, and appointed Pétain, and eventually appointed Foch as generalissimo. Escaped censure for April 1917 and the mutinies - poor old Messimy had taken the rap for Plan XVII three years earlier. I take it that there are still some to identify in the old thread, and that answers should be posted here, with relevant post number? I am sorry that you took it that way. I assure you that it was a mark of respect. You have been big enough to change your mind. Who wrote this ? ? ? "Hindenburg, Ludendorff, Joffre, Jellicoe, French, Haig, Foch, Lloyd George, Wilson and Grey are figures which grow more and more ludicrous and petty as they recede down the tide of time. In the twentieth century millions of deaths and mountains of guns, tanks and ships are not enough to make a bourgeois hero. The best they achieved was a might-have-been, the pathetic figure of T.E. Lawrence." No. He was a playwright. Sidney and/or Beatrice Webb? Or George Bernard Shaw? This person: "I am enclosing two tickets for the first night of my new play. Bring a friend - if you have one." WSC: "Cannot possibly attend first night; will attend second - if there is one." I'm sure he would have been happy to have been mentioned in the same breath as Shaw, so I will say Shaw?